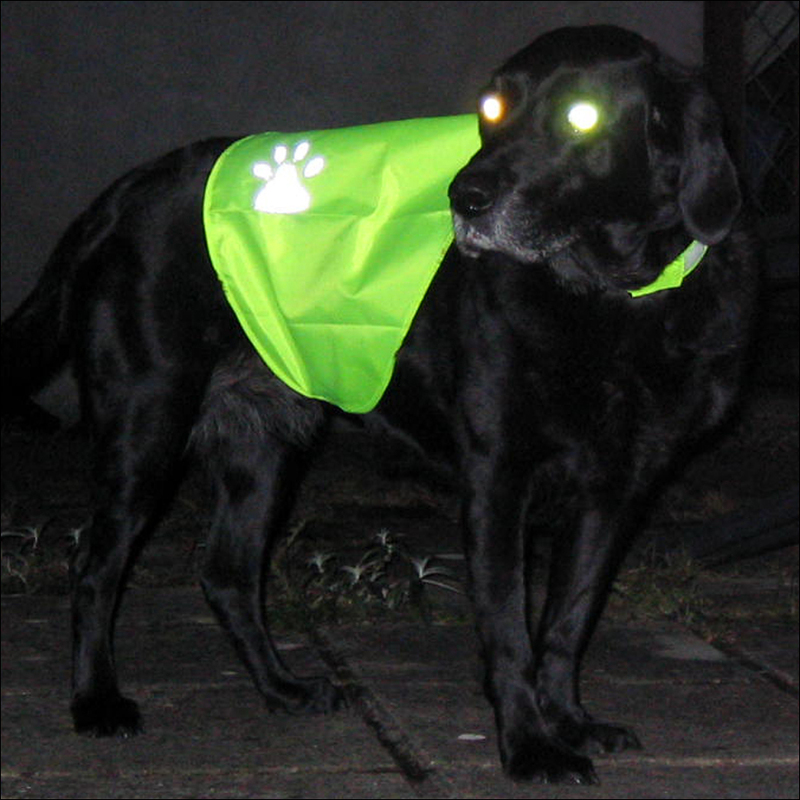 The water-resistant, flexible, tabards are the perfect solution to making sure your pooch can be seen in the dark. In addition to its fluorescent material, each side of the tabard has a paw-shaped reflective panel (there’s another reflective panel at the front of the neck) – shine a car’s headlight on them and they really flare! These tabards can also be used as a lightweight raincoat. The tabards are simple to fit; two pairs of velcro’ed panels are joined together – one pair at the front of the chest and the other pair under the tummy. At the end of this process, you’re going to receive a hi-viz tabard in the post. We’d like you to be delighted when you open the package and find that you’ve ordered the correct size! Please take a few minutes to measure your dog and look at the fitting table lower down on this page. Ordering the correct tabard size will avoid the delay, inconvenience and expense which will result if you need to exchange the tabard for another size. You may be one of those lucky people whose dog will unarguably fit into only one size of tabard. It’s far more probable that you’ll be one of the majority of people who need to make a choice between two tabards. Measure around your dog’s chest. This is the most important measurement – if the tabard doesn’t fit around your dog, it’s not going to fit! As shown in the illustration alongside, from behind the front legs, measure all the way around the widest part of its rib cage and over its back. 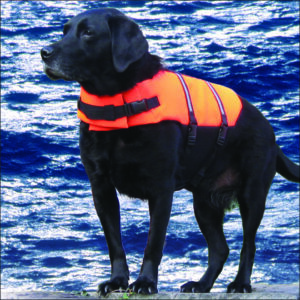 Remember to add an inch or two if you’re planning to use a coat or harness under the hi-viz tabard; also, bear in mind if your dog has a heavy seasonal coat, or whether its size may increase. Whilst you’ve got your dog and a tape measure to hand, also measure the length of its back – from the shoulder blades to the base of the tail. With a note of you dog’s chest measurement to hand, now look at the table below. You’ll see that your dog’s chest measurement will have either determined the appropriate size of tabard or offered a choice of sizes. If, for example, your dog’s chest measured 17″ you’ll see from the table that there are three tabard sizes which are suitable. 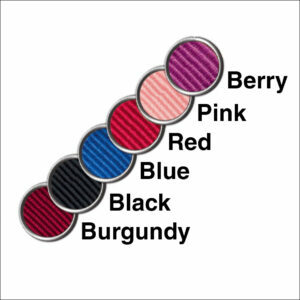 Let your choice from these three alternatives be determined by the length of tabard which you think will be most suitable. If your dog’s chest is smaller than the range indicated in the table then you’ll be able to fit the tabard on the dog but you won’t be able to secure the tabard firmly around your dog’s body. In addition there may be excessive room at the front where the tabard fastens around the dog’s neck. You should probably be considering the next size down. 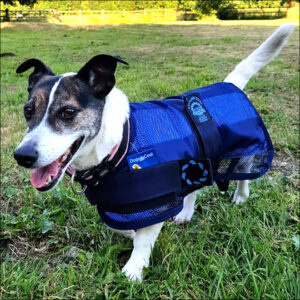 If your dog’s chest size is bigger than the range indicated in the table then the two ends of the velcro fastenings won’t reach each other – the tabard just won’t fit on the dog. You most definitely need to look at the next size up. 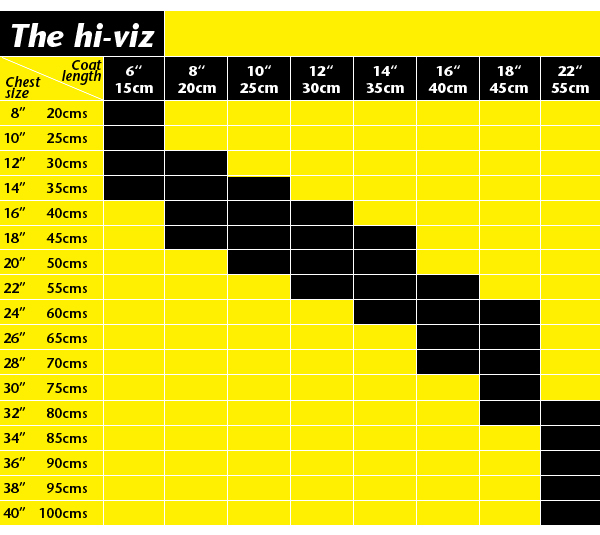 Where the table indicates that two or more sizes of hi-viz tabards may suit your dog, the better size will generally be the larger size. Please remember: the chest measurement is all-important. Tabard sizes for all sizes! 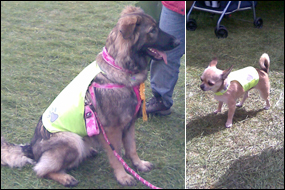 As you can see from the photo alongside, the range of sizes of these tabards suit dogs from the biggest to the smallest! 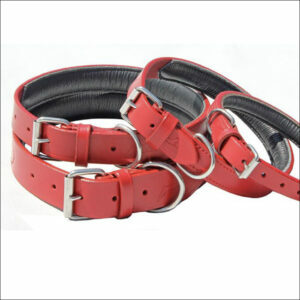 If you’re not sure which size will be best for your pooch send us an email and we’ll help all we can.